This page shows the latest Zerbaxa news and features for those working in and with pharma, biotech and healthcare. 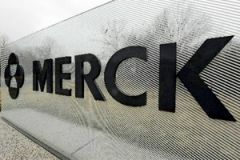 Merck Sharp &Dohme's Zerbaxa (ceftolozane / tazobactam) for the treatment of complicated intra-abdominal infections, acute pyelonephritis and complicated urinary tract infections. Meanwhile, first-in-class insomnia therapy Belsomra (suvorexant) and new antibiotic Zerbaxa (ceftolozane/tazobactam) also got off to a good start, according to chief executive Kenneth Frazier.